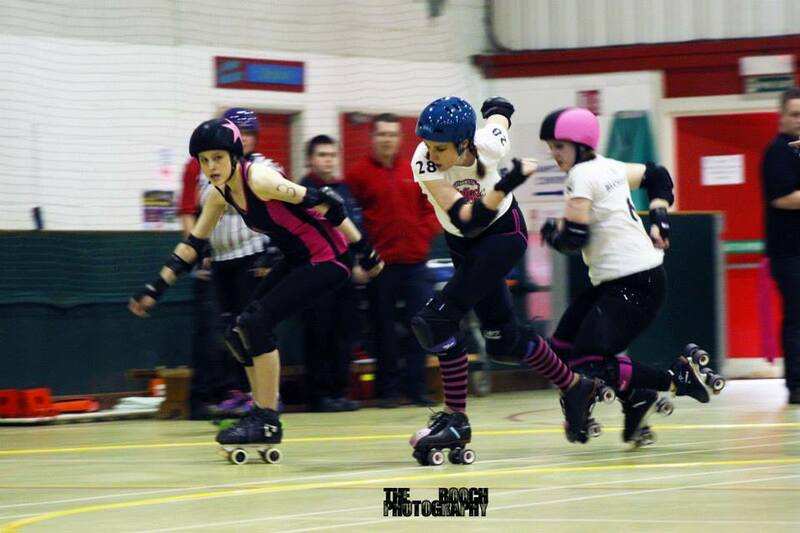 ← For those about to block, we salute you: Blocker Bye Baby’s first bout. The home team capitalized on a slow start for CCR and managed to gain lead jammer status for the majority of the first few jams. Some late call offs on Shoetown’s part and stealth jamming on CCR’s part enabled CCR to still get some points on the board however making it 17 – 6 three jams in. Shoetown’s score continued to creep up for the first 15 minutes of play until CCR received a power play to boost the scoreline to Shoetown 45 – 25 CCR. The points surge gave the visitors new focus as in the succeeding jams CCR’s walls seemed determined to hold back their opposing jammers and were rewarded with their fair share of lead jammer status’. Despite some big hits from CCR, nippy jamming from Shoetown kept their point differential for the first half with CCR staying close on receiving a few power jams. The scores stood at Shoetown 93 – 66 CCR at the end of the half. The second half was a much tighter battle between the two teams. In the first ten minutes of the second half CCR got back into the game after receiving and exploiting a few power plays in close succession, much to the delight of their rambunctious small portion of the crowd. Again the visitors found new legs from this and managed to keep the pressure on their hosts taking lead jammer status and lead of the game. The scores with around 20 minutes of play remaining stood at Shoetown 102 – 109 CCR. The score remained painfully close as the end of the game drew nearer. Shoetown’s jammer would get out of the pack, get lead, score a few, call it; CCR’s jammer would get out of the pack, get lead, score a few, call it. The scoreline see-sawed between the two teams taking the lead until it eventually settled on Shoetown 137 – 138 CCR with 2 minutes left in the game. In the subsequent jam, both jammers almost emerged from the tussling pack a few times, before getting sucked back in by the opposition’s blockers, eventually Shoetown’s jammer exited the pack first, with CCR’s jammer close behind and after hitting the back of the pack and quick call off, scores levelled at 139 a piece. The crowd got on their feet for the final 1.5 minutes of play, which in the next jam saw Shoetown take the lead with a quick 3 point jam. Although CCR managed to call a couple of time outs to force extra jams before the end of the game, Shoetown managed to secure lead jammer and call off the jams before CCR could claw back the deficit. The game ended with both teams (and the crowd) exhausted from the nail-biting match up. The hard fought bout ended with Shoetown Slayers taking home the win, 142 – 139. CCR Roster: 61 Erin Block’hervich (Captain), 14 Blockerbye Baby, 1212 Lola Whip, 1337 The Incredible Hulse, 1832 Emmraa, 22 Em on Bread, 28 Betty bloodshed, 286 Charlie Scraplin, 43 Beth Metal, 44 Nokturnal, 505 Naughtigal Nelly, 741 Axlegrinder McQueen, 80 Skar Siren. Line up Manager: Faze’Her. Bench Manager: Barry Fight. CCR are next in action this weekend when the Centrinnians head down to the UKRDA Southern Tournament. More details to follow!